This is the perfect prop for your newborn's photo shoot! 12-24 months: 17" to 18"
2T - 3T: 18" to 19"
4T - 5T: 19" to 20"
This item is custom made to order. In the notes to seller when checking out, please include size desired and colors you would like. 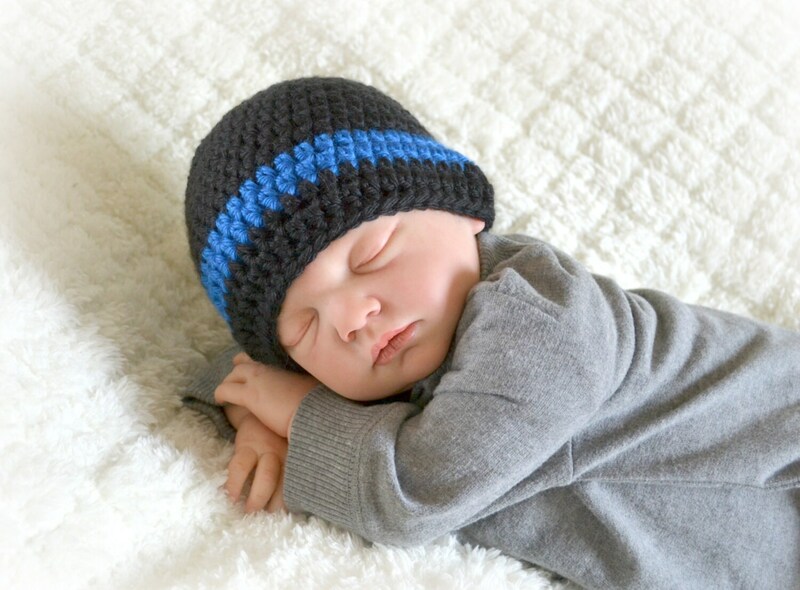 If size is not specified, you will be sent a newborn size hat. Please refer to the last photo for color options. Be sure to check my shop announcement for current production time. Rush orders available at an additional cost. Please contact me about it before placing your order. Be sure to check out our shop for more items and additional sizes! Such an amazing job. I bought 2 hats- one was just a regular black hat with a blue line and then a second with a flower and a blue line.I bought them for 2 police officers that I knew where having babies and they absolutely loved the hats. I ordered the crochet baby law enforcement thin blue line beanie as a baby shower gift. The seller answered all my questions and went above and beyond to ensure I received the beanie in time for the baby shower. The beanie is very soft and looks just as the photo displays. I am very happy with this product and the seller. Thank you.